We next examine the impact of different policies on the climatic variables. Table 5-6 and Figure 5-6 show the aggregate industrial CO2 emissions per decade. Projections of baseline or uncontrolled industrial CO2 emissions in DICE-2007 continue to rise rapidly in coming decades, reaching 19 billion tons of carbon (gigatons of carbon, or GtC) annually in 2100. In the optimal case, emissions are limited to 12.5 GtC annually in 2100. Annual emissions follow a hump-shaped pattern for the scenarios with emissions reductions, with the hump being around 2100 for the optimal case and around 2050 for the climate restrictions. None of the efficient paths—even the one restricting the temperature increase to 2°C—calls for declining emissions paths from the start. By comparison, the ambitious programs of Gore and Stern call for immediate emissions reductions or limitations. 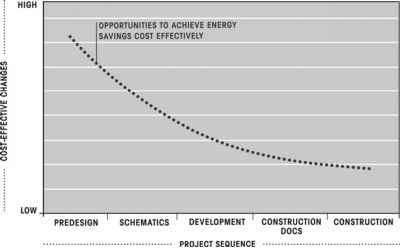 The front-loaded emissions reductions in the ambitious proposals lead to much more costly profiles than the ones that are efficiently constructed and hump shaped. Note: Policies are assumed to be introduced in 2008 unless otherwise stated. Figure 5-6. Global emissions of industrial CO, per decade under different policies. The global emissions of industrial CO, under different policies over the next century. The figure for 2005 is the actual value. 380 ppm in 2005, baseline concentrations rise to 686 ppm in 2100 and 1,183 ppm in 2200. 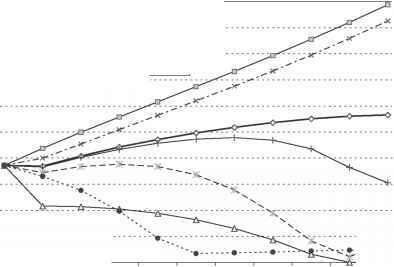 In the optimal control case, concentrations are limited to 586 ppm in 2100 and 659 ppm in 2200. Most of the differences between the CO2 concentrations in the economic optimum and in the climatic-limits cases come after 2050. Figure 5-7. Atmospheric CO, concentrations under different policies. The atmospheric concentrations of CO, under different policies over the next century. The figure for 2005 is the actual value. The increases in global mean temperature are shown in Table 5-8 and Figure 5-8. The baseline temperature increase of 0.73°C in 2005 (relative to the 1890-1910 average). The projected increase for the baseline scenario is 3.06°C by 2100 and 5.30°C by 2200. Clearly, according to the DICE-model projections, major warming is in store because of past emissions and climatic inertia. By comparison, the economic optimum has a projected increase of 2.61°C by 2100 and 3.45°C by 2200. 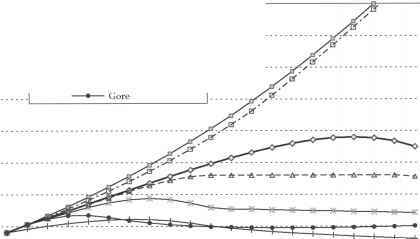 Except for the ambitious policy proposals of Gore and Stern, all runs have very similar concentration and temperature trajectories through the middle of the twenty-first century. After 2050, the scenarios with economic or climatic limits begin to trend downward relative to the other paths. The ambitious programs show a much sharper downward tilt, with warming for both cases peaking at around 1.6°C. The most successful emissions limitation is, of course, the low-cost backstop technology, which has zero effective emissions. Even with zero future emissions, however, the global temperature increase is close to 1°C. Note: Increases are relative to the 1900 average. Figure 5-8. Projected global mean temperature change under different policies. Increases are relative to the 1900 average. 2100. However, the efficient policies have a more substantial impact over the longer run. Relative to the baseline, the temperature reductions in 2200 of the optimal path, the CO2-concentration-doubling target, and the 2.5°C temperature target are 1.85, 2.46, and 2.80°C, respectively.